What will trigger the next correction? On that fateful day, after five days of intensifying stock market declines, the Dow Jones Industrial Average lost an astonishing 22.6 percent of its value (for its part, the S&P 500 dropped 20.4 percent), plummeting 508.32 points after a 5-year run from 776 in August of 1982 to a high of 2,722.42 in August, 1987. 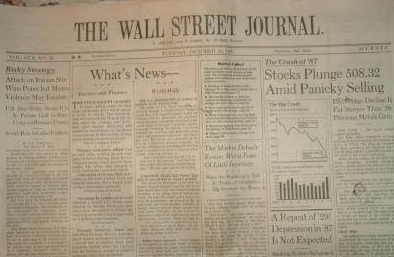 Black Monday’s losses far exceeded the 12.8 percent decline of October 28, 1929, the start of the Great Depression. But a closer look at the coverage and its aftermath is revealing, especially for what is missing. There is no “smoking gun.” According to the Big Board’s Chairman, at least five factors contributed to the record decline: the market’s having gone five years without a major correction; general inflation fears; rising interest rates; conflict with Iran; and the volatility caused by “derivative instruments” such as stock-index options and futures. Although it became a major part of the later narrative, Phelan specifically declined to blame the crash on program trading alone. In other words, the market collapse had no definitive (or even clear) trigger. The market dropped by almost a quarter for no obvious reason. And while it’s counterintuitive, that observation is wholly consistent with catastrophes of various sorts in the natural world and in society. Wildfires, fragile power grids, mismanaged telecommunication systems, global terrorist movements, migrating viruses, volatile markets and the weather are all complex systems that evolve to a state of criticality. Upon reaching the critical state, these systems then become subject to cascades, rapid down-turns in complexity from which they may recover but which will be experienced again repeatedly. This phenomenon was discovered largely on account of the analysis of sandpiles. Scientists began examining sandpiles and discovered that each tiny grain of sand added to the pile increased the overall risk of avalanche, but which grain of sand would make the difference and when the big avalanches would occur remained unknown and unknowable. Notice that often a single grain of sand added to the pile makes very little difference. Sometimes there is a good bit of shifting around. But once in a while the addition of just a single grain of sand can result in the collapse of an entire side of the pile. This finding is consistent with the “butterfly effect” in chaos theory, which refers to idea that a small change at one place can result in large differences in a later state somewhere else. Thus a hurricane’s formation might be contingent upon whether or not a distant butterfly had flapped its wings several weeks earlier. It’s eery — really odd even — but nonetheless true. For the markets, that means that we should not expect ever to be able to identify the trigger of any correction or crash in advance or to be able to predict such an event with any degree of specificity. This understanding doesn’t change my outlook (which remains cautiously constructive), but it does emphasize the need to manage one’s risks aggressively and to hedge appropriately. Tomorrow could be the day that the market tanks…and you shouldn’t expect to see it coming. This entry was posted in Capital Markets and tagged 1987 Market Crash, Black Monday, Risk Management, Self-Organizing Criticality by Bob Seawright. Bookmark the permalink.